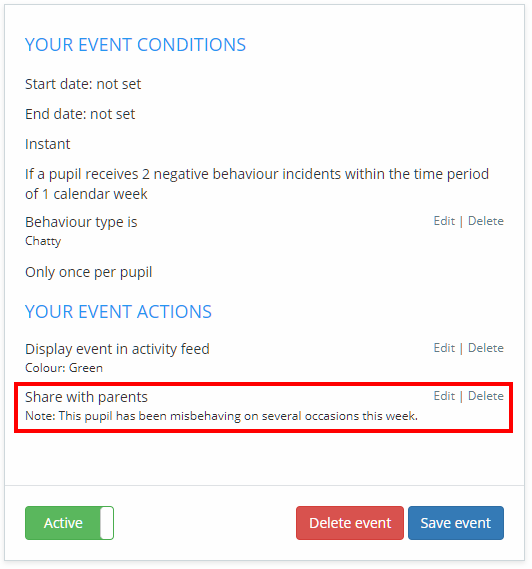 Class Charts lets you automatically track when pupils have met specific behaviour criteria, such as a certain number of behaviour points in one week. To create a new intelligence event, click on the Analytics tab along the top of the page. 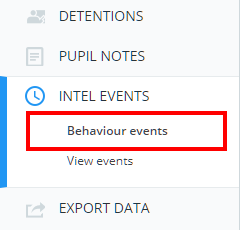 Next, select Behaviour Events from the navigation menu on the left hand side. You will be presented with a list of intelligence events that have been set up in your school's Class Charts account. Click on the Add intelligence event button in the top right hand corner to start creating a new event. A popup will appear, asking you to name your event. Provide a name for the intelligence event and click on the OK button. You will be redirected to the Set up intelligence event page, where you can define how your event should work. A summary of the intelligence event so far will be displayed on the right hand side of the page. The first section of the intelligence event allows you to set how long the event will run for. Click on the Start date and end Date fields to select appropriate dates. If the End date field is left blank, the event will run on continuously until you make the event inactive. 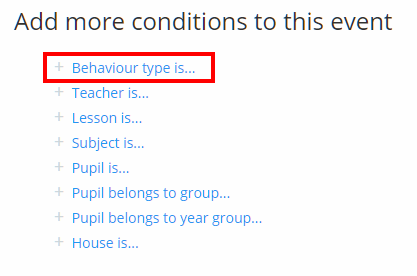 Instant: If instant is selected, the intelligence event will trigger as soon as the conditions have been met for a pupil. Delayed: If delayed is selected, the intelligence event will wait to be triggered until the time period* of your choice. *You can decide when events should be evaluated in the System Settings section of School Settings. Next, select the criteria that need to be met by pupils in order for the intelligence event to trigger. 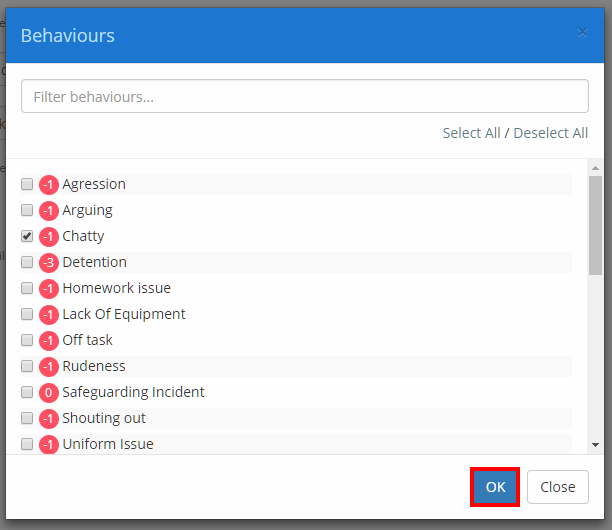 The first drop down allows you to set the number of behaviour points or incidents that are required to trigger the event. 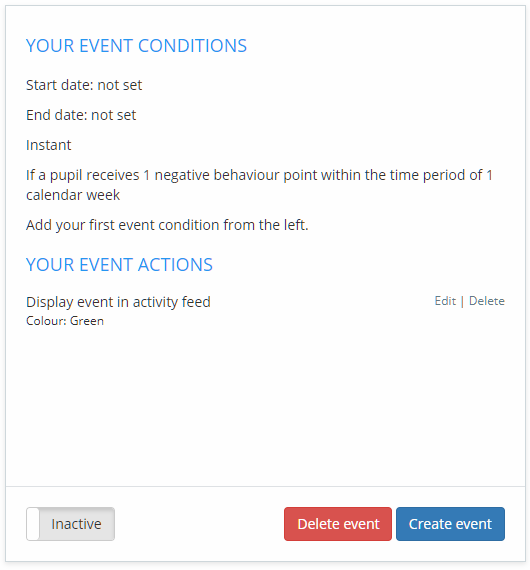 The second drop down menu allows you to set the time period that the pupil can trigger the event in. You can also restrict the event so that pupils cannot trigger it more than once. 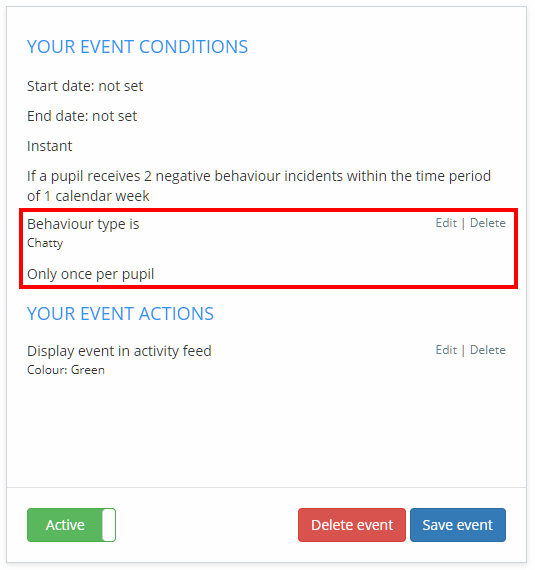 Tick the Only once per pupil checkbox to prevent pupils from triggering the event a second time. Once the core criteria of the intelligence event have been defined, you can then add additional conditions which make the trigger requirements more specific. Click on a condition option to include it in the intelligence event. A popup will appear, allowing you to choose the exact conditions for the event. Click on the OK button once you have made your selections. The new condition will now be present on the intelligence event Summary box on the right hand side of the page. The condition can be edited further or removed at any time, by clicking on the respective Edit and Delete buttons. Once the core criteria of the intelligence event have been defined, you can then define what will happen when the event is triggered by a pupil. Click on an action option to include it in the intelligence event. A popup will appear, allowing you to choose the exact actions for the event. Click on the OK button once you have made your selections. The new action will now be present on the intelligence event Summary box on the right hand side of the page. The action can be edited further or removed at any time, by clicking on the respective Edit and Delete buttons. Once you're happy with the way the intelligence event has been set up, it can be saved and activated. Click on the Inactive button in the Summary box to set the event to Active. 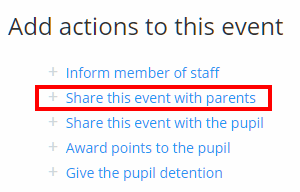 This means that the event can now be triggered by pupils. To save the intelligence event, click on the Create event button in the Summary box . A popup confirmation will appear, indicating that the event has been saved. Click on the Return to list button to leave the page and go back to the list of intelligence events.